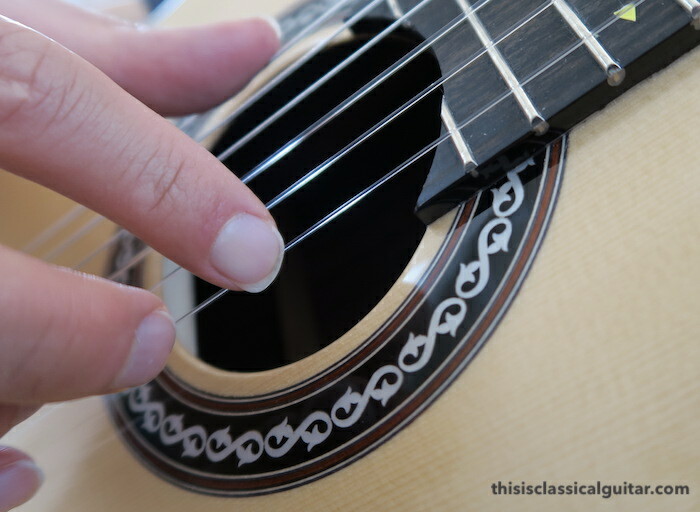 Fingernail lesson for classical guitar. YouTube video link (4k). By popular demand, a lesson about filing and shaping your nails. This is all about how I shape my nails and might be of interest and a starting point for students. Make sure to see the bottom of the post where I have videos by pros that use the opposite shape. Like this lesson?Join the email newsletter or help support the site and free lessons. 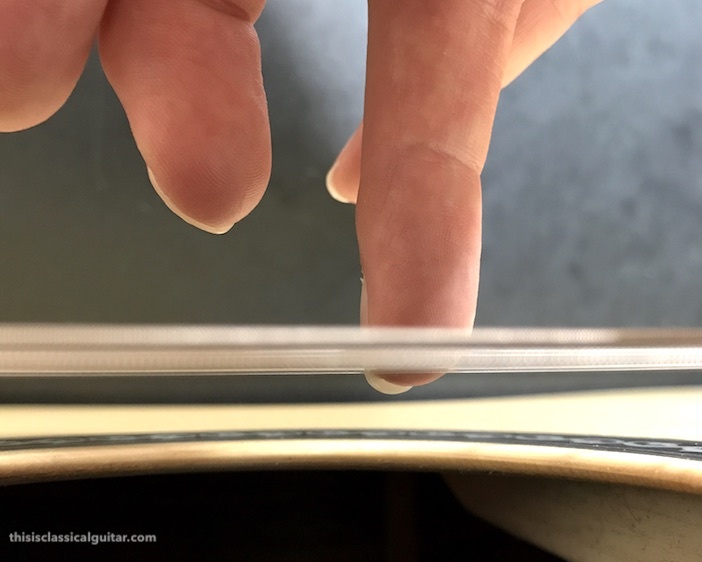 No guitarist is the same – This is not a post on how to file your nails, this is only the way I file mine. This is not a definitive answer and is not a static or unchanging description. 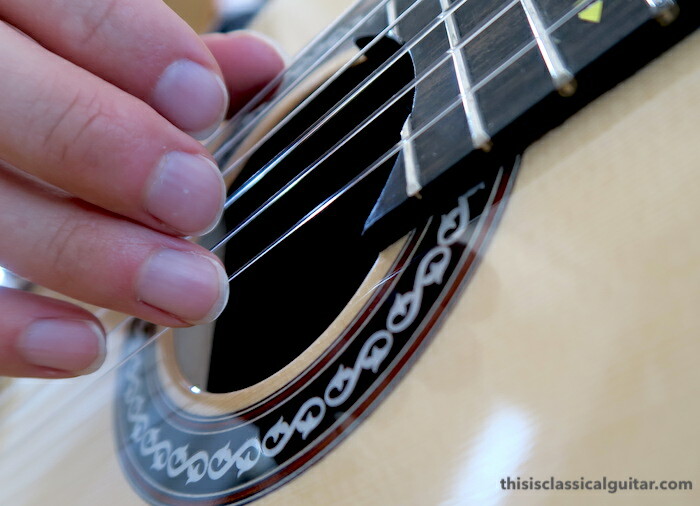 This post is how I file my nails for my guitar, sound, style, and personal preference. Why Use Ramps? 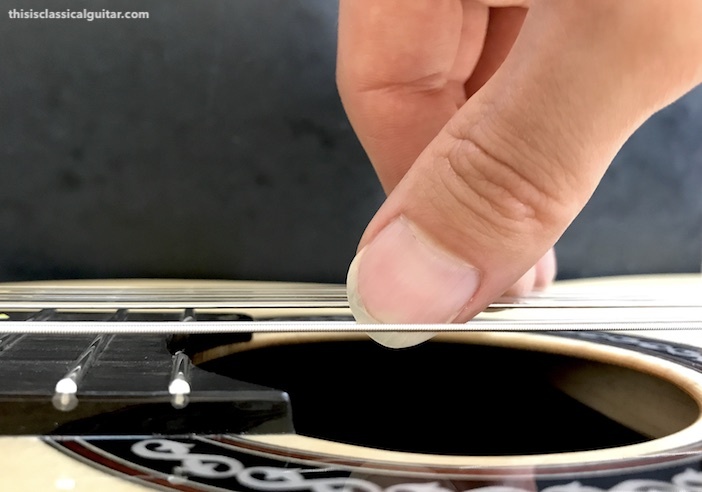 Whether your fingernails are curved perfectly in an arch or you create a long ramp, the idea is to have the string travel up the ramp and get pushed into the guitar. 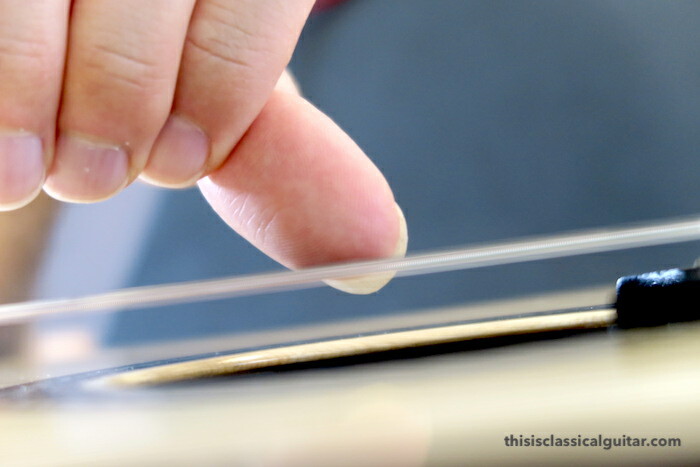 Just like a piano hammer pushes the string (rather than plucks it like a harpsichord), your nail directs the string in toward the soundboard when it moves into the palm. See the video above for clarification. How to find the correct shape for you: Play a comprehensive range of guitar technique when filing your nails. For example: scales, arpeggios, slurs, rest-stroke, free-stroke, sweeping etc. Make sure you can play all the different techniques with ease. Beginner student’s nails are often too long at first making rest-strokes or having a nice arched hand position too difficult. Listen to your tone and find out why/how different nail shapes affect your sound. Experiment with different shapes to discover what works best for you. 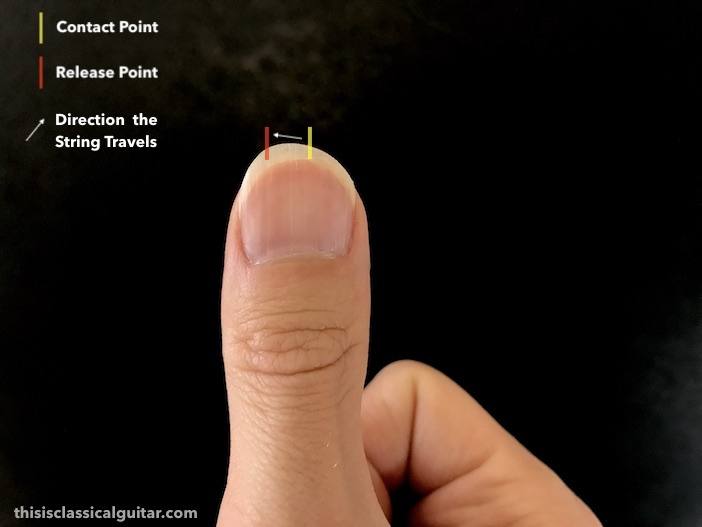 Contact Point – This is where the string makes first contact on the fingertip. I recommend you have both the flesh and the fingernail touch the string at the same time. Release Point – After the string travels up the ramp of the fingernail it releases from the nail. You have to make sure it releases easily if you want a good tone and ease of playing. 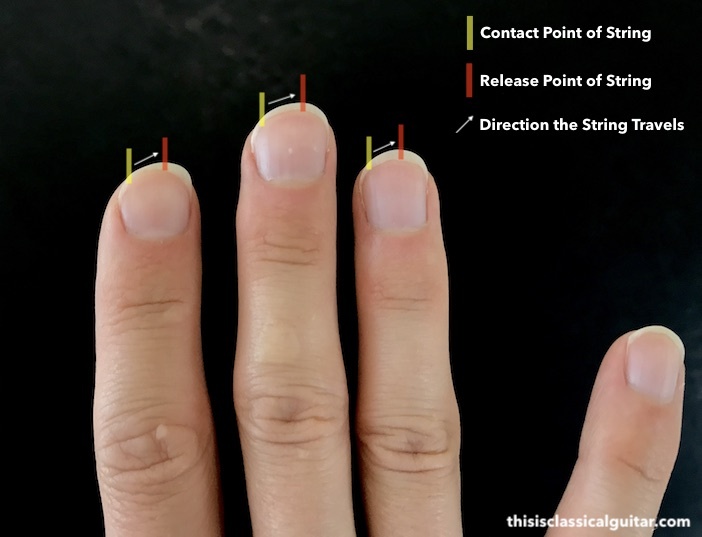 String Direction – The direction the string travels up the ramp of the fingernail. Below is a picture of my fingernails. You can see from the markings where the contact point begins and the release occurs. I’ve tried to keep the perspective from the player’s view so if you hold your hand up in front of your face it will look the same. I’ve also added a flip view for clarity. 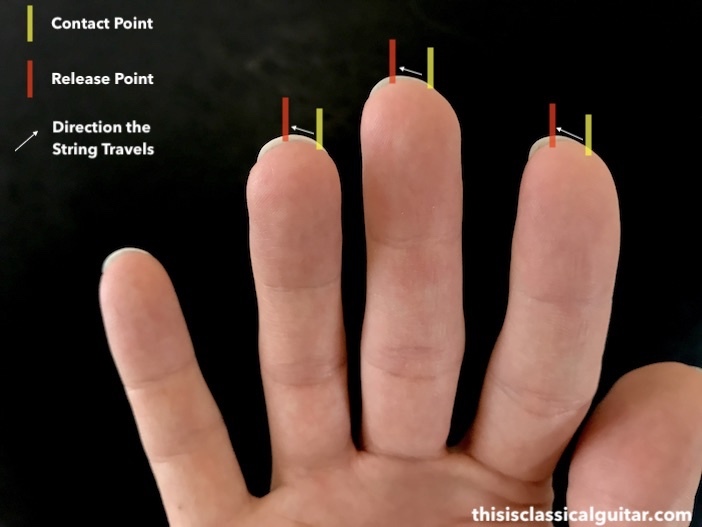 Below is the i fingernail contact point from the player’s perspective followed by an outside view. 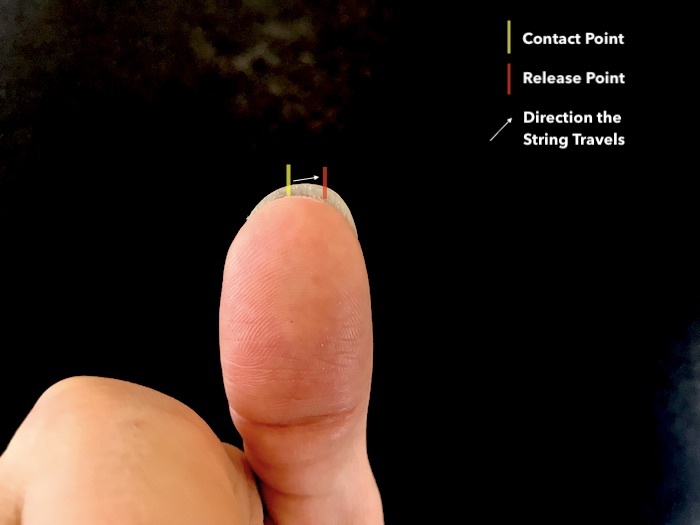 Below is the m fingernail contact point from the player’s perspective followed by an outside view. Below is the a fingernail contact point from the player’s perspective followed by an outside view. Thumbnail – Here is where players greatly differ on shaping style/direction. Actually, many of my favourite guitarists uses the opposite thumbnail shape that I use. Watch the below video to see my explanation. The reason I use this shape is that when I rest my nail on the string at the contact point it doesn’t move up the ramp until I apply pressure to overcome the resistance. My thumb bends quite far at the tip joint, almost 90 degrees so my shape might differ from your as with the length of the ramp. Below is the thumbnail (p) contact point from the player’s perspective followed by an outside view. 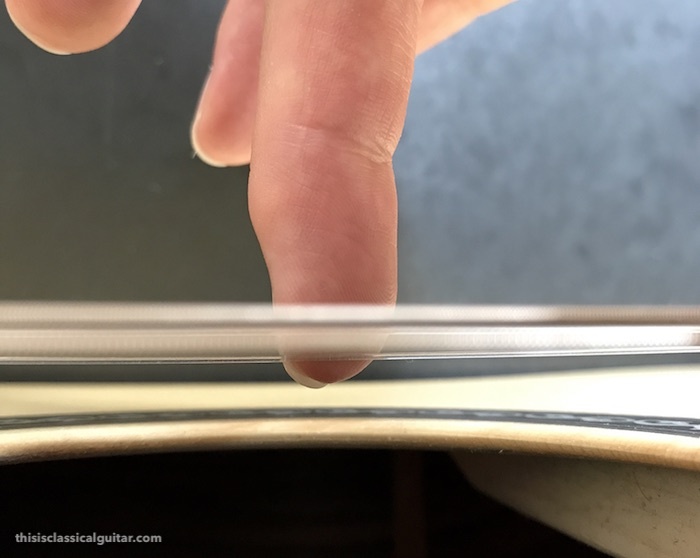 Matthew McAllister gives a lesson on filing the nails for classical guitar. This comes via the excellent Siccas Guitars and their fantastic YouTube channel. He has some excellent points about filing and interacting with the string during the process. The Opposite Shape: A video by Thomas Viloteau with the opposite shape. This comes via his fantastic YouTube channel. One of my favourite pros, Viloteau talks about filing and shaping the right hand finger nails. He shapes his nails in the opposite direction to mine which is great as it shows the variety. Clearly it works for him! Tatyana Ryzhkova gives a lesson on Nail shape, length, and care via her ‘Ask Tatyana’ segment on her YouTube. More of a discussion which is good because context is so important to understanding how to file your nails. Crystal file: Crystal Nail File – I use this first instead of the 2 shaping sides below. Then polish with the buffer sides on the revlon shape & buff. Multisided nail file: Any multi-sided file with a buffer will help shape and finish nails. I start with a crystal file to shape and then smooth and buff with a multi-sided buffer. Micro Mesh: Even better, micro mesh papers seems to last longer and you can be more specific about the grit level. I like the 12,000 for buffing. Plus you can really get under the nail since it is so pliable. Healthy Hoof: Healthy Hoof Intensive Protein Treatment – this is great for two reasons. One, it keeps the nails moisturized which will stop the nail from cracking or breaking. Two, the protein help the nail grow thick and strong. Fingernail Health Supplements: Oral Supplements for Nails– Supports healthy skin, nails, and hair. Read the labels, ask your doctor, buy at your own risk…I just try to eat more healthy. 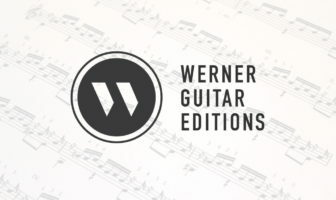 Books on classical guitar nail shaping: The Bible of Classical Guitar Technique by Hubert Käppel has a good three pages of excellent text, plus it’s a great book to own anyway. Pumping Nylon by Scott Tennant has a good blurb on how to do the nails and accounts for different types and shapes of nails, although I’ve found it to be a bit confusing and not comprehensive enough. I know many of you will completely disagree with my advice. However, please remember that this is how I shape my nails and I am not recommending you do exactly the same. Everyone’s hands, technique approach, and sound are different so, therefore, our nails shapes must also be different. What’s your thoughts and constructive criticisms on this? 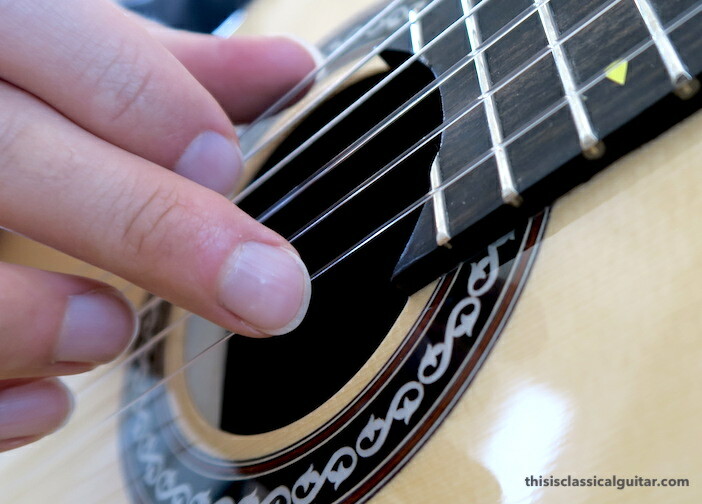 Find more free classical guitar lessons at the Lesson Archive Page. OK, I like this… BUT! The most important thing about nail shaping is that you don’t lose sight of playing the guitar. The seriousness with which I file my nails depends dramatically on how much time I have to play guitar, as that goes down, so does my ability to shape my nails. Normally, I just smooth them a bit, keep them the right length and go at it. Yes, the thumb is the one most people differ on! it is very subjective! the important thing is to play very well!! OMGoodness! I have had my ramp going the wrong way for 30 yrs!…. being left-handed, I mis-read all the pix that have ramps. Thanks. I will dwnld and save the pix for future referrence. Gord, I a right handed player and have, like you, ramped my nails in the opposite direction. Just for fun, I’ll ramp them in the direction of this description and see if it makes a difference. My luthier has told me to not use my nails at all. I keep my pretty short so they are barely there yet I feel the tone and color is much better with nail than without. Broke my thumbnail today, now I will be aware of bumping it for at least another week, and I’m sure other players have been there and vowed to catch a nail snag before this happens. This is the most comprehensive and detailed coverage of nails I have seen to date. A much needed resource, many thanks for putting it together in such a thorough manner! Don’t forget that if you perform in halls your sound is less harsh from the further from the guitar you get. Sometimes the sound your after is not the one you hear but rather the one from the back of the hall. I am a newcomer to the guitar, at 73 years of age, and I wish to learn classical (I am also attempting to make a classical guitar). I did read that one way to define your nail shape was to fold a piece of emery paper 2″ square and fold it in half, place this over the G (3rd) string and then proceed to ‘play’ with your hand. This will wear the nail that is in contact with the string and give to a guide on where and what shape to file them. Like every thing else with classical guitar I find nail shaping confusing as there does not appear to be any definitive answer. Hello – I enjoyed reading your article. I would like to ask for your permission to translate your article to Hebrew and post it. Heavy credits and active link at the very top of the article please! Otherwise go for it. Thanks, this is useful info for someone who has never filed their nails. While learning “Recuerdos de la Alhambra” I figured I’d better learn a tip or two! I just started learning classical guitar. My teacher says the right thumb initially contacts the thumbnail at its middle, and then slides off on the left side of the thumb. This whole fingernail shaping thing is really vexing a beginner, but it’s so important to get the shape right. i play fingerstyle guitar on a steel string and keeping my nails right to perform every day is the worst chore out of everything. i get them just right and it only lasts 2 days, not to mention my thumbnail frequently needs a fake nail glued on because all the repetitive bass plucking shaves it down faster than it grows. wish i could just have adamantium nails surgically installed. Here is my problem: First of all, I am a left-handed player, but that’s not the problem. I have an unusual thumb nail that folds down somewhat on the side that makes contact with the string. If I point the tip of my thumb towards me, instead of the nail looking like this; ( it will look like this: (_ . That’s an exaggeration, to be sure, but I am limited by the keyboard symbols! Thus it will quite often snag the string creating a God-awful double-forte TWANG in the middle of a nice soft piano passage. I’m wondering if I should cut the nail short and glue on a guitar nail. What do you think? My thumb nail is oddly shaped as well, making filing and shaping quite the challenge. I usually start my students without nails anyway so I wouldn’t worry about it for a year or two. Back in the days when I started getting my nails “done”, I was laughed at. Right now it is actually trendy among guitar players in my hometown. My issue is that my nails curve- especially my thumb nail. It curves to the point where the flesh of my thumb hits the string instead. How can I flatten it out without breaking it? Hello Bacon Bacon…I am in no way a professional performer. That said, I (used to) play out a whole lot, weekly in fact, while I tended to my sheep farm here in central Maine. So, your thumb nail is not, in your opinion, acceptable. Well, then you’ve got to work with what you’ve got, not with what you wish you had. Who cares, other than you, that your nail is “different”. I suggest you work with it and get ‘your’ sound. You might be surprised with what you come up. Work with what you’ve got, chill, be open, chill…you will get a wonderful sound that will be yours. Your thumb is not a liability, it’s a gift. Just my 2 cts. Hi! I am a newbie and I am complimenting your terrific instructions / books with Frederick Noad’s book. I am trying to replicate the sounds/tones in your videos but I am having an issue with fingernail scratching sounds on the strings. Can you please confirm if this is mostly to do with my fingernails not being polished enough or a bad shape (they are just the normal shape at the moment). My technique would appear to be sound (re your advice), so I am thinking it may be the nails. Many thanks, hope you can advise. Could be your nails. I mean there is some nail sound when we play but it usually isn’t heard by the audience. Study the article and a few other videos and see how it goes. Make sure to have great nail files with polishing sides. Also, some strings are noisier than others. 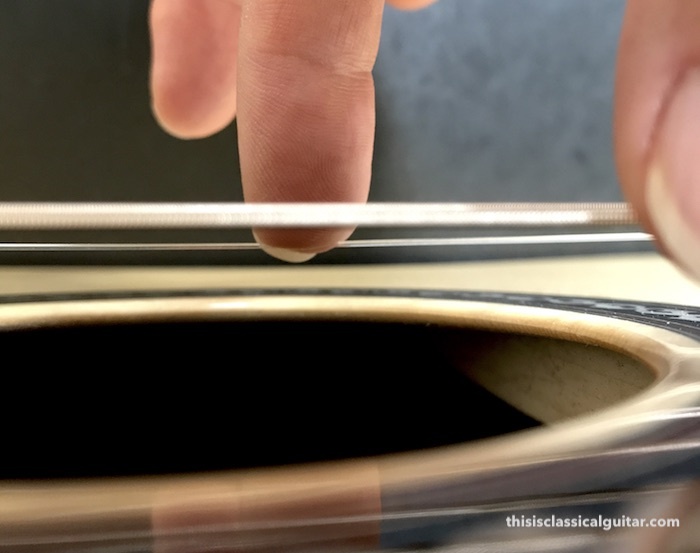 A clear nylon string will have less noise than a rectified string or composition (sometimes). Thanks for your feedback. I will try and improve the nails and see how it goes.By the way, I am using Augustine strings. Look forward to progressing through your Volume 1. Thank you Brad for all the hard work it undoubtedly took to put all this together. Thank you for all you do for us mere mortals! I have a thumb nail that has a crease through the middle of it leaving the left side of the thumb with a hook. I tend to play with the thumb itself and with very little nail. I have to forgo the relaxed thumb position and play with a somewhat arched thumb shape so the nail doesn’t snag. (Thankfully this does not tense my right hand) I would however like to get a clearer tone. Some recommend that with a hook nail it is better let the nail grow longer and others say it’s better shorter. Any suggestions on length and or shapes? (I’m not interested in heating the nail to correct the shape). Thanks. Well, first off, there are many oddities with everyone’s nails, even with pro players. So yes, experiment with different lengths and shapes (it’s time consuming to experiment, I know!). I often find that students also need to examine their entire hand and sitting position as well since this affects all the angles. In the end, having a teacher carefully examine your technique and nails is the most helpful. Online learning is only a supplement. BTW this video was extremely helpful! Thank you. I have problems playing with my thumb. I always file the nail the opposite side, but I’ll try your way and see if helps me. 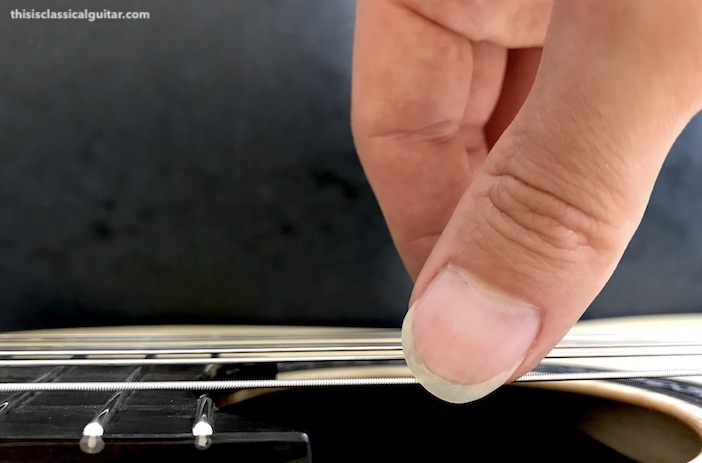 When playing on the bass strings with i, m, a you can tilt the hand angle so the nails pluck more perpendicular to avoid the scratchy sound. It’s a very subtle adjustment but makes a difference in those specific situations where you find yourself on bass strings and need a clean sound. Sometimes when pros are on a stage the audience can’t really hear the scratchiness though.